Video clip synopsis – Stuart Cunningham gives an overview of core broadcast media. Broadband MP4 overview_bb.mp4 (8.2MB), suitable for iPods and computer downloads. Film came into its own in the 1910s, radio in the 1920s, television in the 1940s and throughout this period, newspapers were at their zenith. So these are the core broadcast media. And when you think about what their role has been, I guess the first thing to say is, I would like to suggest that they have been the engine of modernity – both here in Australia, and in the West in general. They have brought nations together. 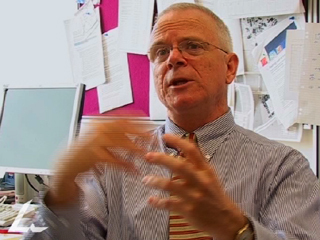 There’s a writer called Benedict Anderson who wrote a book called Imagined Communities and he ascribed the role to the media of creating national identities, of allowing large and vast populations to imagine themselves connected with each other through reading about each other, hearing about each other, and through watching each other on television. So the media have been constitutive of that great engine of modernity of the nation. Secondly, they set agendas. One thinker in this area has said ‘the media don’t tell us what to think, but what to think about’. So in that way, they set broad agendas. In that way they bring us together as well. And also, of course, we disagree with each other but we are in dialogue with each other through the broadcast media. And finally, I think the broadcast media are a form of ‘cross-demographic communication’. That’s a term that media theorist John Hartley uses to describe the role of television – but I think that you can describe all of the broadcast media as being a way of cross-class lines, crossing income lines, crossing ethnic lines, giving people a sense that they are a part of a commonality and part of a public culture. So all of those things have been the role of the broadcast media in Australia and in other societies. And in many intriguing ways, we are coming to the end of that period. 1. Match the date with these developments in media. 2. What is meant by the term ‘national identity’? Brainstorm ideas about its meaning, look up dictionary definitions and then examine how the term is used in the video clip. Using the internet and other sources investigate how the term has recently been used by our Prime Minister. What are the values that appear to underpin his meaning of national identity? Do you agree with his interpretation? 3. In the introduction to this video clip, Stuart Cunningham states that the broadcast media was the “Engine of Modernity.” What do you think he meant by this term? How has broadcast media driven society? Cunningham also suggests that it is the media that connects society with itself and provides a national identity. Do you think media such as film, radio, television and the Internet might assist in constructing an identity for a society? How might it do this? Why? What other key factors contribute to our national identity? 4. It has one timed been argued that ‘the media doesn’t tell us what to think, but what to think about’. What does this mean? Discuss the issues in the statement.